If Ibrahim knew the source of his dagger, then I have little sympathy for him. Seriously. Think about it. “HAHA, I have a dagger from the Norse God of Trickery! Nothing bad could possibly come of this!”. Yeah, no. If the dagger were given to him in a way in which he doesn’t know the providence, then yeah, he’s in over his head and I don’t blame him one bit for not liking it and being confused. It’s a balancing act. When Gods say they need their power back, it gets your attention. And eternal paradise is a really nasty thing to hold over a servant’s head (Coal’s). Which really brings us back to Loki. If the god’s really don’t need to fear Ragnarok, now’s a pretty good time to lay out the reasons why. If Ragnarok is a big bloody deal, then sapping the god’s ability to withstand Ragnarok is really kind of a bad idea, and you’d think it apropos to be expected to take responsibility, which Loki really hasn’t done. Especially since he dropped these items on unsuspecting mortals. I want Ibrahim’s hat. Not only does it look nice, but it stays on in wind, rain, and being thrown a thousand meters into a harbor! You now have an adventure bigger than you expected! Oh, and welcome to the crew of the Loki Naval Vessel Rollo! I don’t think he wants a welcome. Love Loki’s eye roll. Looks like he’s going to have to save Coal from his own diplomacy. Also, Ibrahim? If Coal wasn’t already dead, he’d now have an idea that he might be able to ransom you. Bad move there, buddy 😉 . To be fair, he has reason to assume they’re taking him as a slave. Being ransomed might be a step up from there. Everyone is a little out of their element on this ship. Except for Loki I guess. Well, Coal definitely has a 0 in diplomacy. Hope that Loki speaks up and finds a way to explain it. He put all his skill points into Strength and Con. Charisma is his dump stat. You can’t kidnap me, violent stranger! I’m the beloved son of an important rich man! Oh, Ibrahim. You poor, naive child. Even if they weren’t on a divine mission, you’d be screwed. Ibrahim, grow up and get a clue. If these guys didn’t have more important problems, you’d have just earned the citizens of Cordoba a tax hike on account of your massive ransom. And generally the peasants don’t like that. Makes their torch-and-pitchfork hands start itching. “The what of wh— I don’t care, you’re staying,” or something like that is next. So Ibrahim’s father is the Caliph? That makes me wonder when this story takes place. Also, I’m assuming Ibrahim a second or (more probably) an even lesser son. 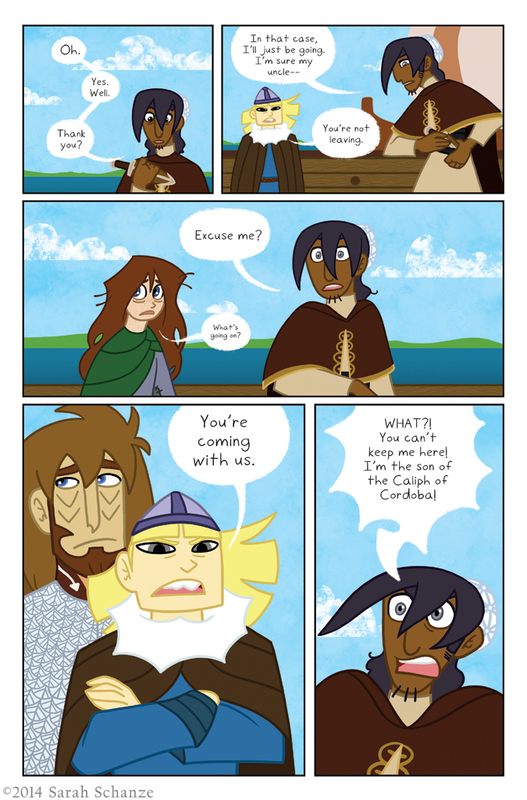 Story takes place during the Viking age! And yeah I haven’t said it in-comic but Ibrahim is the 9th son. Raoullefere, if my mind do not tell me a lie, Ibrahim elder son. You know, when Loki’s rolling his eyes, it’s probably a bad plan. Yeah that’s probably a sign things are going really badly. It’s kind of Loki’s fault though. He didn’t talk with Coal ahead of time and it’s his fault that the weapons were even split in the first place. If he doesn’t like how Coal’s doing things, he should try to plan ahead a bit. Perhaps before Coal runs into the next shard bearer. Coal: “Caliph…what? My a***ss! You come with me. Don’t care about your origins”. Ibrahim reminds me of Bilbo, taken by a wizard and a short grumpy guy on an adventure, originally partly against his will. Will he reconsider? Haha! That’s a fun comparison! Because he has the biggest mouth. Oh yeah? Well I’m a spirit made corporeal, he’s a pagan demi-god, and she’s an ex-slave! So, Snap! Actually, as I recall, Loki was a certified member of the Aesir. Isn’t Loki usually considered a jötunn? Although the Prose Edda includes him, ambiguously, as #13 on the list of twelve Aesir. I said he was a certified one, not born one. He’s still a Frost Giant brat. Actually, I think that Loki the God is a Jotunn only in the Marvel comics and movies but in Norse myth was Aesir. There was another Loki in the myths was indeed a Frost Giant and leader of the Jotunn but was a another person since he challenged Thor and Loki (the god) to a series of games. That’s a pretty epic eyeroll from Loki there. He’s very good at them. I’m sure that he’ll a LOT of practice with them over the storyline. This does bring up an interesting question in a world where at least some gods are real. We know the Norse gods exist…so does Ibrahim’s (and Hedda’s) god exist? Will that god be annoyed at having one of his servants used as a pawn in another pantheon’s shenanigans? If so, then most likely. So why does Ibrahim have gray eyes? Don’t most dark-skinned Arabs have dark eyes? Ibrahim has gray eyes because I gave him gray eyes! I don’t think they’re radically uncommon, and I liked how they make his eyes pop. You did a wonderful job making them distinct from Coal’s eyes. Fun fact, many of the Caliphs of Cordoba were born to native Iberian concubines to the point that most had relatively little Arab heritage. Abd-ar-Rahman II,I who first assumed the title, was only a quarter Arab. Unless Loki can find a way to avoid it, Ibrahim may well end up abducted. I like how Ibrahim’s eyes look different from Coal’s because Coal’s don’t have shinies and Ibrahim’s do. It makes Coal’s eyes look dead. Luckily it isn’t that bad. Hey Sarah. For some reason I got the idea that Hedda’s cross necklace was one of the missing pieces, and that was what drew Coal to her. But his behavior towards her – though surly – was no where near the level of aggressiveness he showed to Ibrahim. So is the cross just a cross? The reason Coal got super aggressive against Ibrahim is because Ibrahim stopped him (or…tried to). Hedda never tried to fight Coal, so he had no reason to be aggressive in the first place. If only Ibrahim wasn’t so easy to get riled up!